The second in a series: the master filmmaker's prose scenarios for four of his notable films. On the first day of editing Fata Morgana, Werner Herzog recalls, his editor said: With this kind of material we have to pretend to invent cinema. And this, Herzog says, is what he tries to do every day. In this second volume of his scenarios, the peerless filmmaker's genius for invention is on clear display. Written in Werner Herzog’s signature fashion — more prose poem than screenplay, transcribing the vision unfolding before him as if in a dream — the four scenarios here reveal an iconoclastic craftsman at the height of his powers. 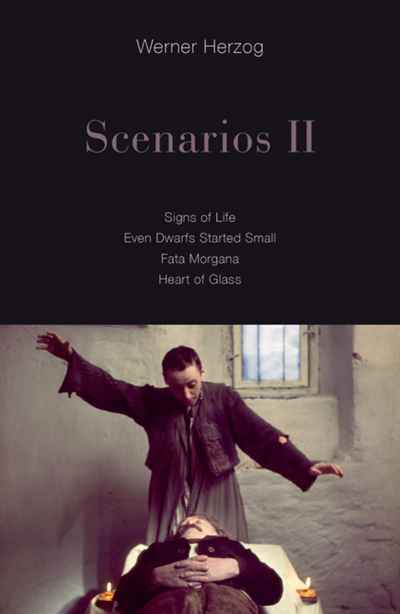 Along with his template for the film poem Fata Morgana (1971), this volume includes the scenarios for Herzog's first two feature films, Signs of Life (1968) and Even Dwarfs Started Small (1970), along with the hypnotic Heart of Glass (1976). In a brief introduction, Herzog describes the circumstances surrounding each scenario, inviting readers into the mysterious process whereby one man’s vision becomes every viewer’s waking dream.